Thanks to Visit Ballarat, Gastrology was in Ballarat over the weekend for Made of Ballarat, a new artisan focused destination campaign enjoyed launched a by Visit Ballarat, which showcases the city’s artisans and creators through a variety of media including cinema, creative events and publications. It was wonderful to explore this region that is located a mere 90-minute drive North West of central Melbourne. The Made of Ballarat campaign includes a weekly series of mini events in Ballarat hosted by the local artisans. This interactive program commenced in October 2018 and covers masterclasses in Art & Design, Food & Drink, Produce, Craft and Entertainment, offering travellers a range of experimental activities to experience during weekend escapes. Ballarat Premier Apartments is housed within Heritage Listed building a constructed in 1901. We thoroughly enjoyed our stay in one of their beautifully appointed studio suites. The room featured high ceilings with crystal chandeliers, kitchenette facilities, LED TV/DVD and Wi-Fi. On arrival we were also spoiled with beautifully baked goods from Le Péché Gourmand boulangerie – patisserie, a French bakery-pastry shop in the heart of the Goldfields in Creswick. The peach tarte amandine was our favourite thing from the basket of goodies - melt-in-the-mouth and just the perfect amount of sweet. 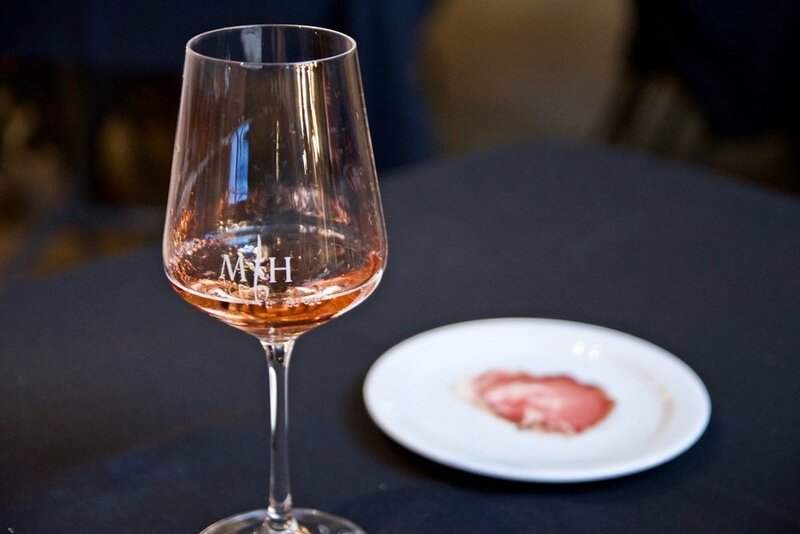 There was no better way to spend the afternoon than a lazy long lunch with Mick Nunn from Salt Kitchen Charcuterie and John Harris of Mitchell Harris Wines. 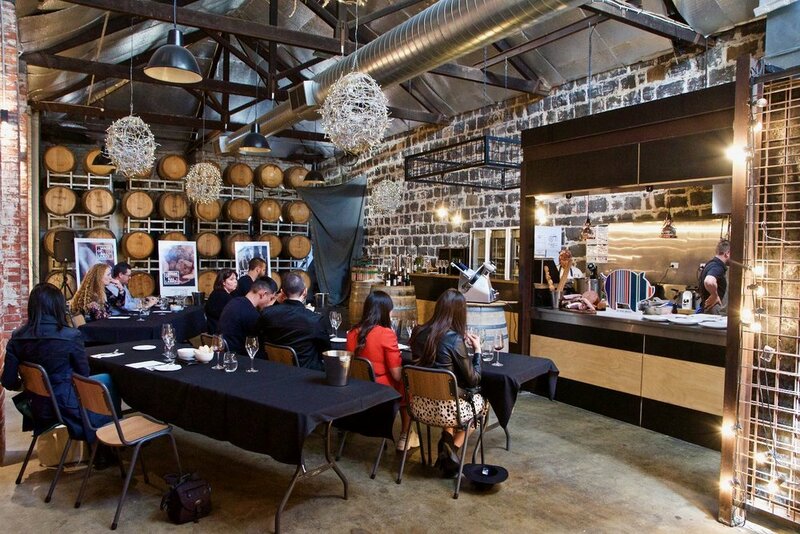 Mitchell Harris Wines’ Barrel Room was turned into a classroom for the day, where guests watched demonstrations on how you can work with pigs to prepare dishes using every part of the animal. Each dish which highlighted a certain cured pork was also paired perfectly with a delicious wine by John. Salt Kitchen Charcuterie is committed to using the whole animal - sourced from local suppliers, Western Plains Pork. It was an amazing opportunity to learn about salumi and charcuterie whilst enjoying a truly delicious lunch. Lunch included six simple dishes constructed using products that come from all parts of the pig, starting from the back leg with terrine and French ham then the barrel with bacon and pancetta. This was followed by products from the shoulder and neck and finished with the head. Think Ham hock and parsley terrine and pancetta wrapped quail stuffed with pork sausages and a classic whole egg spaghettini carbonara with crispy guanciale. Simply sensational! Secretly tucked inside an alley way, The Lost Ones Basement Bar is an absolute gem. Originally the Masonic Temple's dining hall, the venue is moody and is the perfect backdrop for enjoying your favourite tipple. Whatever you do, make sure you try their amazing selection of Scotch. One of the very few bars in Victoria that are a Scotch Malt Whisky Society partner bar, the venue boasts an impenetrable list of interesting whiskies. It’s the perfect opportunity to appreciate some single cask, single malt whiskies. The last time we were in Ballarat, we fell in love with highly acclaimed Catfish Thai. When we heard that the restaurant had closed we were devastated. Luckily, our grief was quickly replaced by excitement when we heard that Damien and Danielle Jones’ have in Catfish’s place opened Mr Jones - A restaurant which draws upon Damien and Danielle’s experiences at Bibendum (a Michelin starred restaurant in London) as well as their hatted restaurant in Ballarat, Catfish. Mr Jones boasts a thoroughly modern dining experience which celebrates seasonal local produce carefully prepared with great skill and inspired by European and Asian flavours. And boy, does it impress. The venue is sleek and modern but not at the expense of warmth. 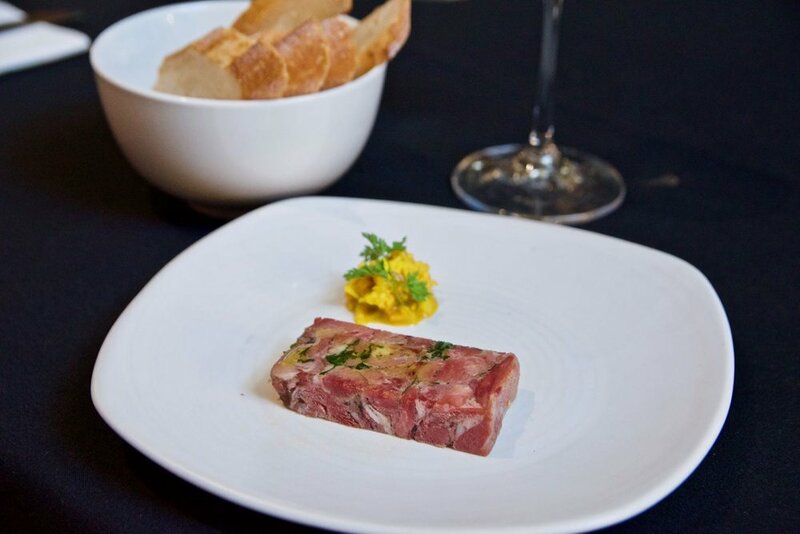 Fully licensed, the dining experience is completed with a well curated boutique wine list and cocktails. Our culinary experience started with crusty rosemary and potato bread served with aromatic basil and parsley oil. Simple yet simply delicious. To follow, grilled eggplant, sesame, tamarind dressing. This well-conceived dish was bursting with flavour and took full advantage of the eggplant’s most notable characteristic – its supple flesh. The thick pieces of creamy eggplant flesh melted in the mouth in a manner similar to unctuous pork fat. This gem of a vegetarian dish was one that commanded respect. The sher wagyu beef cheek was similarly delicious. Coated in a thin layer of crisp spiced crumb, the beef cheek was very tender and fell away easily with the weight of the fork. The accompanying braising sauce was rich and utterly delicious with slices of pickled radish providing some contrast. A cheeky call-back to Catfish, the dish of betel leaf, rose apple, toasted coconut, ginger, palm sugar caramel was stunning. Flavour laden bites with a multitude of intense flavours, highlighted by the gentle heat of the chilli jam. Mains continued the trend of the evening – Delicious. The goats cheese dumplings were a thing of beauty. Chewy dumpling pastry encased slightly tart goats cheese which was then tossed in a hearty mix of burnt butter, pine nuts and currants and finally topped with crispy sage. For meat lovers the lamb truly hits the spot. A modern take on a provincial French dish, the lamb rack was cooked to perfection (tender and pink in the middle) and served with a moreish brick of pressed lamb belly, atop a bed of braised lentils. To finish a good selection of cheeses and desserts await. Think Triple cream Brillat Savarin with homemade quince paste, Mango, passionfruit and lime caramel mill-feuille or peanut parfait served with raspberry marshmallow, coconut and chocolate. If you’re in need of your daily hit of caffeine then look no further. Websters Market and Café serves single-origin coffee by Industry Beans, poured by adept baristas using their shiny Synesso machine. peas, almonds, spinach, roasted garlic, goats cheese, avocado and finished with a poached egg encasing oozy yolk. For something lighter the Chia Pudding is wonderful – creamy almond chia pudding adorned with grapefruit curd, poached and freeze dried fruits and toasted almonds. In between all your wining and dining, we recommend stretching your legs and taking a relaxing stroll around Lake Wendouree and sneaking in a visit to the Botanical Gardens. A leisurely stroll around the entire 6km lake takes approximately 2 hours. Sitting atop a hill Tuki Trout Farm boasts 80 kilometres of uninterrupted views of the Loddon Campaspe Valley. The perfect place to relax away the day, Tuki offers guests the opportunity to try their hand at fishing. The best part is, you are guaranteed to catch a trout! You don’t need to come prepared – these guys have fishing rods, bait and nets for hire. Dedicated ponds surround the grounds where guests can relax and take in the vistas while catching a fish or three. When you have caught your trout the lovely folk at Tuki also clean and package it for you to take home, or alternatively, we recommend that you have it cooked in the restaurant for lunch. Under the guidance of Chef Ben O’Brien, the kitchen is in safe hands. Expect beautiful dishes made from locally sourced produce (a lot of which is from the property itself!). To start we recommend the shared Tuki platter which features their lovely house smoked trout and Tuki smoked lamb sausages. Everything was prepared which great care and tasted amazing. For mains the Fresh baked rainbow trout (which you have caught) is the piece de resistance. Served bone free with crushed green peppercorn dressing, locally grown potatoes, and locally baked bread. Another must have dish is the lamb. Think perfectly cooked tenderloins of native pasture fed lamb seared with garlic.